Well Mint Design has been busy in the shop immediately after New Year’s! We’ve got more equipment and cutting going on in the shop. We’ve addressed deficiencies in 2013 and taken in a lot of feedback from our clients. The three main areas were dust control (from all the bead blasting prior to powder coating), obtaining drier compressed air (to improve CNC cutting, bead blasting and powder coating) and the ability for bending CNC cut parts (long thin pieces to short thick pieces). We’re in the process of building, setting up and testing all these new pieces equipment, all while keeping our shop running and turn around time as short as possible. We’ve got a lot of things on the go! Here we are cutting some 1/4″ plate, with AVHC lockout with 60% cut speed for all the holes (results in straighter holes with less taper) and 100% cut speed with AVHC active when cutting the bend lines and perimeter. These brackets are destined for a motorcycle shop in the Saskatoon area. We also picked up something to reduce the dust in the shop and reduce plugging the shop vac filter with media dust from all the bead blasting. Most would use a dust collector, however floor space is a premium in our shop and the less cleaning of bags and filters the better. 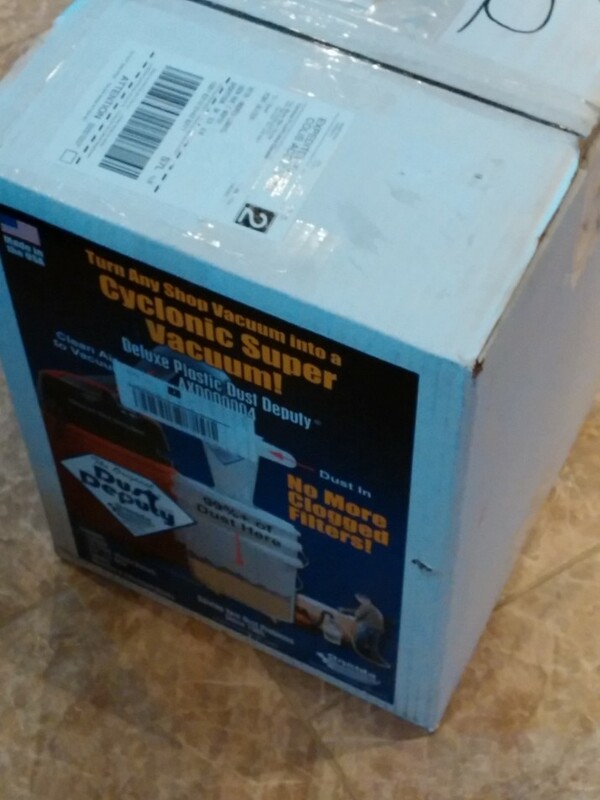 This dust collector uses basic centrifugal force to have the dust drop out of the air and into the bucket, with minimal dust entering the shop vac. Similar to the cyclone technology touted in Dyson’s and other bag-less vacuums, same principle just on a larger scale. This should prolong filter life and reduce the level of maintenance required. We’ll be sure to post updates once it is set up and how well it works. And finally we had our Baileigh box and pan brake show up. Due to our small shop it took a bit of creativity, a lot of safety straps and muscle to move this 750lb unit around the shop! Thanks to the local Fastenal rep., Matt, for the patience while we unloaded it from the truck onto the hoist. It was a bit tricky without a forklift or the use of any overhead crane. After it was unloaded it was unboxed and then maneuvered into place next to the CNC table. 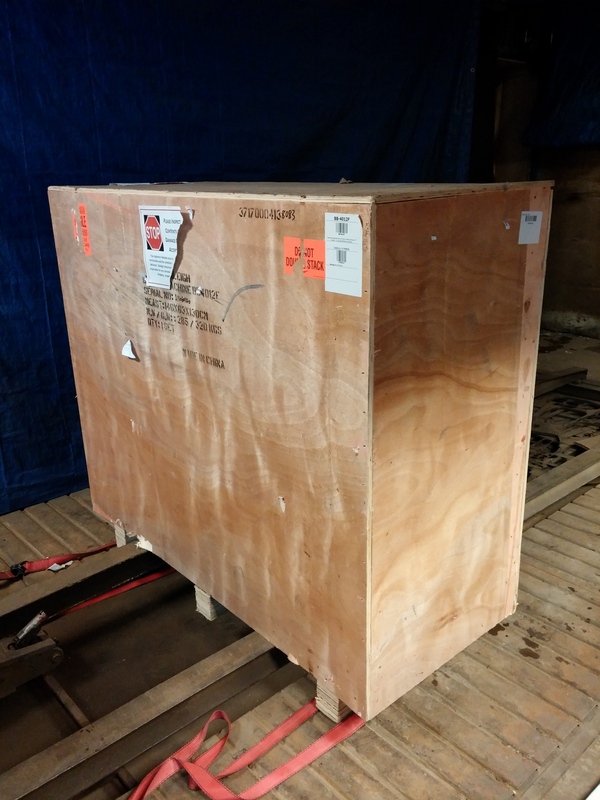 This box and pan brake will allow us to do 12ga at 40″ wide, anything thicker we can use our hydraulic press and other tooling to bend up to 5/8″ steel plate. 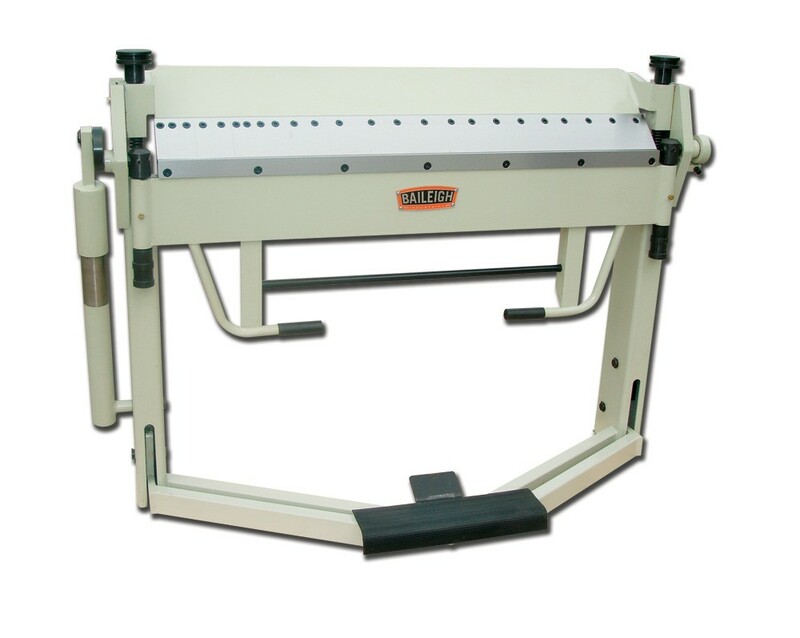 Keep posted for our new bending services in the near future! December was a very busy month for us with finishing up a few projects and with year-end. That is the reason for the lull in blog posts. However we have some new equipment and projects to show. There should be a greater frequency of blog posts in the future. We are in the process of developing a new product that will take some time to prove out, so stay tuned for future details! We didn’t take many photos in December of the projects worked on, but this one turned out really nice. 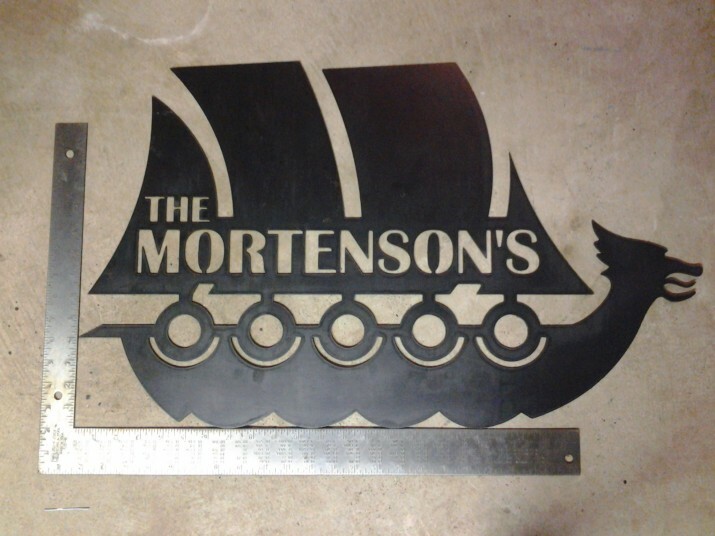 It’s cut out of 10ga steel, weighs 10.5lbs and is 30″x18″ in size. The small detail that isn’t seen is that there are two center marked/punched areas on the top of the sails. They are each 4.5″ on either side of the COG (center of gravity) of the part. So that way when the holes are drilled out and it is hung, it will be put even tension on either chain/cable/rope when it’s suspended. We have also been busy taking note of our clients requirements over the last year and acquiring more equipment in the shop to fulfill those needs. We’re setting up a refrigerated air dryer to ensure that our compressed air system in the shop is as dry as it can possibly be. We’ve had the odd issue here and there when cutting material and having a bit of moisture pass through the nozzle of the plasma torch. 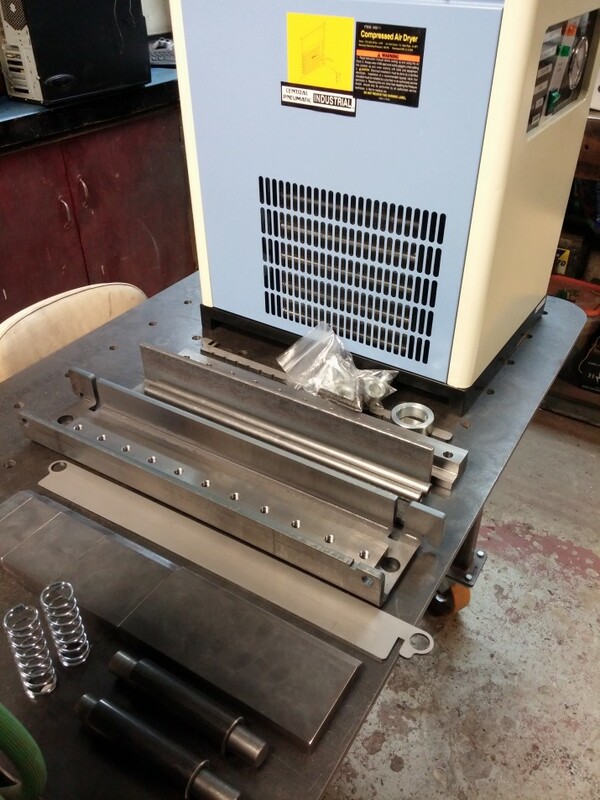 It’s sometimes enough that we have to recut the part, reset the origin of the CNC table, etc… Basically wasting time and material, this air dryer will solve that problem and ensure that our CNC table, bead blast cabinet, powder coating and any other air tools in the shop receive moisture free compressed air. This brake will allow the bending of heavier materials (at limited width), however we have another brake showing up that will allow us to do up to 12ga steel (16ga stainless steel) at 40″ in width. After quite a bit of research it was settled that the best option would be a Baileigh Industrial BB-4012F box and pan brake. Here’s a photo of it from Baileigh’s website. 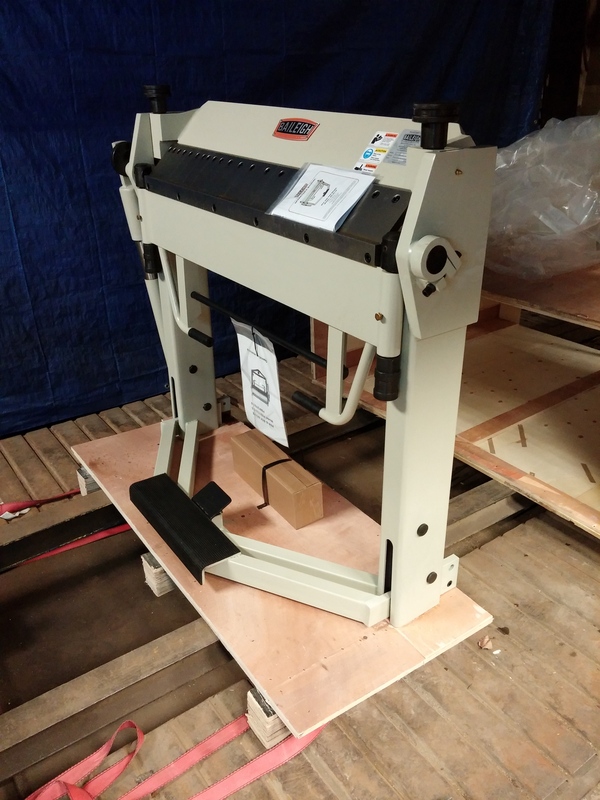 We’ll be sure to snap some photos when it arrives and makes its new home next to the CNC plasma table. 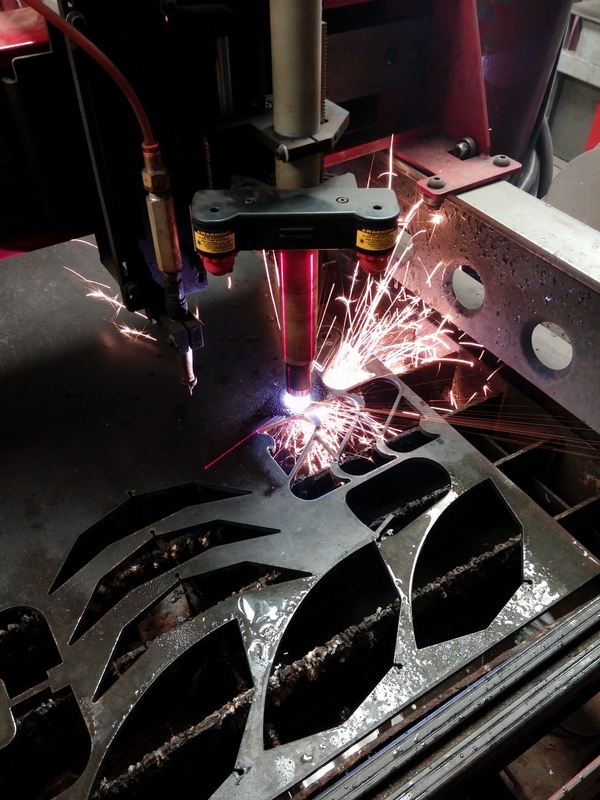 In the past we’ve been able to get by slitting seams during the CNC plasma cutting process in order to reduce the amount of effort required to bend a piece of material. However this isn’t practical in all applications, and due to feedback from our clients we are always striving to improve our final product or find deficiencies in our processes that could be improved. Bending plate or sheet was something we had to improve on and we did! Keep posted for setup pictures of the new equipment and new service pages added once we get everything dialed in and running.